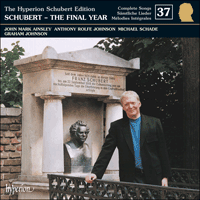 The glories of this final disc in the Hyperion Schubert Edition are hard to over-praise. Three tenors sing 20 songs from 1828, the last year of Schubert’s short life. The programme begins with Auf den Strom (On the River) sung by German/Canadian Michael Schade, with horn obbligato superbly played by David Pyatt. This is followed by Herbst, the two unrecorded Refrainlieder and a fragment, Lebensmut. Then follows Schwanengesang sung by two tenors: John Mark Ainsley sings the Rellstab settings (including a wondrous Ständchen and a heartrending In der Ferne) and Anthony Rolfe Johnson sings the Heine ones (including a hair-raising Döppelgänger) and, at the end, Die Taubenpost, Schubert’s last song. The two halves of Schwanengesang are separated by Glaube, Hoffnung und Liebe sung by all three tenors. He was an artist … Who shall stand beside him? This is the final issue of the Hyperion Schubert Edition, and the number of volumes in the completed set, an asymmetrical thirty-seven, seems symbolic of unfinished business – an apt reminder that the composer’s life, like that of the hero of Die schöne Müllerin, ended in midstream. In this last year of Schubert’s biography we feel ourselves short-changed – not, heaven knows, by the quality or quantity of the music, but because this precious and extraordinary period comes to an end far too soon: it even fails to fill the requisite twelve-month span of a proper chronological survey. Schubert died on 19 November 1828, and we wonder at the cruelty of the fates in refusing to grant him more time – a mere six weeks would have taken him to the end of the year, and then he would have been only a month away from his thirty-second birthday the following January. In following Schubert’s life day by day during this period the modern observer is taken aback by the swiftness of the composer’s departure, as were his own friends and contemporaries. There is nothing orderly, much less inevitable, about this sudden exit – no sense of full-circled achievement in the glorious twilight of life – as was to be the case with the elderly Goethe, for example, who died in 1832. It is tempting to imagine that we see Schubert’s own awareness of his impending doom in the magnificent works of those last ten creative months, some of which, with the advantage of hindsight, seem to have a valedictory quality about them. But even though the composer knew that he suffered from an illness with an alarming long-term prognosis, it is certain that he was as surprised as everyone else by the speed with which he slipped away; we hear fatalistic acceptance as well as sheer disbelief in his words “Here, here is my end” as he touched the damp wall of his brother Ferdinand’s apartment. The unhappy medical circumstances that were behind this sudden fatal deterioration will be discussed later in this essay. One can only imagine how many discs would have been needed to contain all the songs of a Schubert who had lived, like Bach for example, until the age of 65: if the composer had been granted until 1862 to complete his creative task the number of song volumes in this series would have more than doubled. On these we would find many more settings of Heine than the six on this disc; there would have been, almost certainly, Schubert’s Lenau songs, his Eichendorff and Mörike cycles, his Geibel, Reinick and Chamisso settings, and many more lieder by Rückert and Seidl. … as a result of their journey to see the ageing Goethe in 1831 Schubert and Vogl were able, at last, to perform for the old Lion of Weimar; the enthusiastic reception of the songs prompted a return to that poet’s texts, and a preoccupation with the second part of Faust leading to the great work for various voices and orchestra which is counted as the greatest of all musical monuments to the poet. Having dabbled in Scott and Shakespeare in his twenties, Schubert followed Schumann in an attempt to encompass world literature in song with settings of translations of Burns, Byron, Moore, Hans Andersen and even Hugo and Gautier – the composer’s friendship with Thackeray, and his later acquaintance with Dickens, played a part in this world-view; he became friendly with a number of younger Austrian poets – successors to Seidl and Bauernfeld – who would have remained unknown to music-lovers (and missed-out on immortality) if it had not been for Schubert’s avuncular interest in their work (his only really successful opera made the name Adalbert Stifter as famous in musical circles in the 1850s in a similar way to the renown he had given renown to Wilhelm Müller in the 1820s); the early masterpieces Winterreise and the connected Heine and Rellstab cycles were stepping-stones to the later glories of the song repertoire – the immortal Tieck and Uhland cycles. And so we could go on, for there is no end to this game of consequences. (A Louis Bieder Meyer re-make of It’s a Wonderful Life would have been less kitsch than Lilac Time, and would have put the talents of the bespectacled Richard Tauber to better use.) One can only ponder the differences that one man’s continuing presence might have made to the world of music. The addition of Schubert to the list of the living after 1828 is a particularly strong example of how many things might have been different had he survived, particularly in terms of the work of the composers who came after him. Grillparzer was roundly attacked by Schumann, no less, for the seemingly patronising tone of inscription (quoted at the top of this essay) on the monument for Schubert’s grave (pictured on the front of this disc) in the Währinger Friedhof. The words ‘fairer hopes’ are usually taken to be an underestimation of the work already accomplished. (Grillparzer was not particularly knowledgeable about the composer’s output, and how could he be? Much of the music was unpublished, unknown and undiscovered.) But the greatness of the Schubert works which were known to exist does not preclude, surely, ‘noch schönere Hoffnungen’ which may be taken to refer to the whole, rich range of creativity and international contact that are reserved for any artist’s maturity – the time of reaping rewards for all that has been sown in the youthful years (think of Haydn and the late Beethoven). In this respect Grillparzer’s observation does not belittle the works we possess; it simply means that the life which came to an abrupt end in the cramped home of Ferdinand Schubert in the Wieden suburb (today Kettenbrückenstrasse 6), could so easily have been filled with even more unimaginably joyous things for the world of music. What Schubert has already given us makes us greedy for more. But it was not to be. Der Liedersänger zum Quelle der Lieder. The singer of songs to the source of the songs. These words were read aloud in the first minutes of 1828 at Schober’s residence in the Tuchlauben where Schubert had been a lodger since the spring of 1827. The party was an exclusively male gathering: Schober and Schubert were present of course, as well as Josef von Spaun (who was engaged to be married), Moritz von Schwind (who was soon to leave for Munich to continue his studies as a painter) and those helpful young law students and diarists (helpful to Schubert scholars, that is), the Hartmann brothers who were due to return to Linz in July. The poet of these melancholy prophecies, Bauernfeld himself, was attempting to take the leap from being a civil servant to being a successful dramatist. Thus, at the very beginning of the year, there is a feeling that an epoch is coming to an end: now even this second generation of Schubertians (Spaun and Schober were survivors from the first) was on the point of breaking up. This accounts for the valedictory nature of the poem, rather than any conscious prophecy of the composer’s demise. Such a gathering of the friends was almost always followed by a visit to a place like Bogner’s coffee house where the jollifications could continue into the morning hours. On the evening of January 2, Franz von Hartmann noted Schober’s uncontrolled and petulant behaviour when disagreeing with Josef von Spaun on the subject of duelling. This is one of many contemporary observations concerning the character flaws of Schubert’s closest friend – the year opens thus, and Schubert’s life closes with further evidence of Schober’s egocentric behaviour. An important development of early 1828 was the reinstatement of the reading-circle evenings at Schober’s house where literary works of current interest were read aloud (having failed to establish himself as an actor in Breslau, we can imagine how much the host needed an admiring forum for his thwarted thespian talents). As Schubert lodged as a guest of the Schobers it is highly likely that he was present on many of these occasions, even when not specifically mentioned in the documents. On 5 January there were readings from Zedlitz’s Totenkränze and Kleist’s Marquise von O; this latter work was continued and completed on the gathering of 12 January, and Heine’s Reisebilder of 1826 was begun. This work delighted Franz von Hartmann, particularly the witty passages about the poet’s youth in Düsseldorf; but Heine’s ‘false tendencies’ were also noted – his enthusiasm for Napoleon was not welcome to a German patriot. (This work contained the six poems that Schubert set as part of his Schwanengesang; thus the theory that these songs were first sketched as early as January or February 1828.) On 2 February Kleist was featured once again, as well as Prometheus by Aeschylus; on 9 February Goethe’s Pandora; on 15 February poems from the Schlegel cycle Abendröte from which Schubert had already set a number of poems in 1819/20 (see Volume 27), a sign, surely, that the composer’s reading interests were independent of anything that Schober had on offer. On 23 February we encounter for the first time at these readings (though not the last) Schober’s own sonnets on biblical themes, published in Breslau in 1826 under the title of Palingeneses: from now on these were regularly interspersed with rather more distinguished literature. On 1 March Ludwig Tieck’s Die Gemäldegalerie was the focal point of the evening, and this author continued to hold sway during the meetings of 8, 15 and 22 March. Thus the meetings continued on Saturday evenings until early August (with a long break between 3 May and 14 June) the featured readings being further pieces by Goethe (Faust as well as less well-known works by that master) and more Tieck and Kleist. But this is to jump ahead into the summer while winter still prevails. On 10 January the song Gute Nacht (the first number from Winterreise) was performed at the evening entertainment of the Musikverein. This was sung by the tenor Ludwig Titze (often spelled Tietze); the documents do not reveal the name of the accompanist – perhaps it was the composer himself. The publication of Part One of the great cycle – the first twelve songs – was advertised in the Wiener Zeitung of 14 January. In the accompanying announcement the publisher Tobias Haslinger informed the public that the ‘second half will follow as soon as possible’ (in fact these twelve songs were to appear only after the composer’s death). Haslinger’s advertisement also refer to Schubert’s ‘warm feeling’ and ‘daring imagination’ in a manner which suggests that these qualities were already taken for granted by a public familiar with the composer’s talents; not for the only time in 1828 do we sense that true celebrity for Schubert was not very far away. (This impression is strengthened by a review of the first part of Winterreise in the Theaterzeitung on 29 March which stated that ‘Schubert … does honour to our Fatherland and our time’.) The composer could still have his failures however: one of these was the first performance of the notoriously tricky Fantasie in C for violin and piano given by the violinist Josef Slawjk and the pianist Karl Maria von Bocklet. This attracted uniformly lukewarm, if not bad, reviews, and it remains a work which requires a sovereign performance in order to convince. Much more successful was a reappearance of Ständchen to a poem by Grillparzer on the evening of 24 January. This had been written in July 1827 at the behest of the Conservatoire teacher Anna Hönig; her sister Josefine was the mezzo-soprano soloist, and Anna’s female pupils at the Conservatoire made up the chorus. At the last minute, Schubert was fetched from next door to hear the first public performance (the Schober house was very near the Musikverein building in the same street) and was said to have remarked that he had no idea that the piece was so beautiful. As a result, it was included in the concert of Schubert’s works given in the Musikverein the following March. On 28 January there was a large Schubertiad at the lodgings of Josef von Spaun to celebrate his engagement to Franziska von Roner. Fifty people were present on this occasion, when one of Schubert’s piano trios (probably the B flat major) was performed. The celebrated violinist Ignaz Schuppanzigh was invited to take part in this, as well as the pianist Karl Maria von Bocklet and the cellist Josef Linke. (It is notable that Schubert, ever ready to accompany his own songs, preferred to have this piece performed by the virtuoso Bocklet.) That other fine Schubert pianist, Josef von Gahy, was also present; he and the composer played a piano duet (probably the A flat major Variations on an original theme, D813) to such entrancing effect that Gahy is said to have kissed Schubert afterwards. Only two nights later there was another Schubertiad, this time at the home of the Court Secretary Witticzek, followed (according to Franz von Hartmann) with a ‘supper, then a ball, then a drinking bout, all very jolly’. It was also during this month that the composer sketched the wonderful Fantasie in F minor for piano duet which he was to show to friends in fair copy some four months later. Although Schott naturally asked for ‘lowest fee possible’, this initial letter must have led Schubert to believe that the firm was interested in publishing a great deal of his music. Each subsequent communication was more of a let-down; after a great deal of to-ing and fro-ing, consultation with the Paris branch and so on, Schott was prepared, by October, only to risk publishing Mondenschein, a quintet for male voices and piano, and even this came to nothing for financial reasons. Probst too was also concerned to find cheap material, but he was downright exploitative: he seems deliberately to have misunderstood the composer’s stated financial terms, and in due course sent an inadequate fee in advance for the huge E flat major Trio. The publisher calculated, correctly, that Schubert was extremely keen to publish this work (which, as Christopher Gibbs has pointed out, can be seen as his special tribute to Beethoven) and that he would not return cash sent in advance, even if the deal was unfair. Probst was to cause the composer much anguish in the last months of his life because of the way in which the firm dragged its feet in publishing this work; in the end, Schubert was never to see this Trio in printed form. Invitation to the Private Concert which Franz Schubert will have the honour of giving on 26th March, at 7 p.m., in the Room of the Austrian Philharmonic Society, under the Tuchlauben, No. 558. 1 First movement of a new string Quartet performed by Herren Böhm, Holz, Weiss and Linke. 3 Ständchen by Grillparzer, soprano solo and chorus, performed by Fräulein Josefine Fröhlich and the lady pupils of the Conservatory. 4 New Trio for piano-forte, violin and violoncello performed by Herren Karl Maria von Bocklet, Böhm and Linke. 5 Auf dem Strome [sic] by Rellstab, song with horn and piano-forte accompaniment, performed by Herren Tietze and Lewy, jun. 6 Die Allmacht by Ladislaus Pyrker, song with pianoforte accompaniment, performed by Herr Vogl. 7 Schlachtgesang [actually Schlachtlied D912] Klopstock double chorus for male voices. All the musical pieces are composed by the concert-giver. Tickets at 3 f1. V. C. t are to be had at the art establishments of Herren Haslinger, Diabelli and Leidesdorf. It is significant that Schubert himself postponed the original date by a week in order for the concert to take place on the first anniversary of the death of Beethoven – 26 March. The Viennese public who had made such an event of Beethoven’s funeral the previous year seem hardly to have noticed this act of piety, but it must have seemed an important detail in Schubert’s own mind: the concert was both an act of homage and a challenge – part of the composer’s almost obsessive concern that he should now be recognised as Beethoven’s loving and devoted son-in-music, and thus the new head of the ‘family firm’. The inclusion of Mirjams Siegesgesang in Schubert’s original concert plans shows how concerned he was to was to fulfil prophecy, as it were – Beethoven had promised an oratorio to the Philharmonic Society with a text by Grillparzer, and had studied the Handel oratorios as a preparation for this project. It is little surprise, therefore, that Schubert’s 1828 cantata about leading the tribes of Israel into the Promised Land is distinctly Handelian in tone, and it is written to a Grillparzer text. By now there is a fairly constant stream of critical comment from home and abroad, most of it favourable, concerning Schubert’s works. We read good reviews of a number of songs, and regular announcements concerning the publication of new ones. But it is clear that Schubert felt that the success of his lieder was in danger of restricting his reputation by typecasting him. This accounts for his desire to publish the E flat Trio in all haste, even if he was inadequately paid for it. He now had to show himself capable of writing important instrumental works; after all, Beethoven had earned worldwide respect with such pieces, not through vocal music. Schubert’s concern to mark the anniversary of the death of Beethoven in March 1827 was much more than an attempt to capitalise on the disappearance of older competition. The great composer’s departure from the Viennese musical scene seems to have had a huge effect on Schubert’s inner sense of artistic self-worth: he looked around and, in answer to Grillparzer’s rhetorical question printed at the top of this article, he could see no one to stand beside Beethoven apart from himself. It seems he now cared little for contemporary fame or money (he had been through that phase as a composer of unsuccessful operas); rather does he seem to have had an eye on the judgement of posterity. In this we may be tempted to see a man convinced he had only a short time to live; but we could also perceive the energy and excitement of someone who felt that he had everything to live for now that he was unquestionably the most distinguished composer in Vienna. Indeed he may have suspected the truth: that in 1828, and Rossini notwithstanding, he, Schubert, was the world’s greatest living composer. (Weber, a possible contender, had died in 1826). Such a perception would have been heady and exciting, but with whom would the modest composer have dared share such an hubristic thought? Perhaps Schober, and if so, this would be a measure of their intimacy. Such awareness of one’s own destiny when quietly and privately assimilated (as seems to have been in Schubert’s case) is a lonely responsibility, and this accounts for a certain dogged earnestness in his continuing determination – to the grave as it happens – to establish and mark his connection with Beethoven. The old battle between Schubert’s low sense of personal self-esteem and his awareness of his lofty musical powers was at last being won in a positive manner – a result of that healing maturity that eventually comes to the rescue of self-doubting youth. The power of the stern father, Franz Theodor Schubert, was increasingly neutralised by the composer’s success and growing financial independence; and now Beethoven, the father-figure-in-art with the power to belittle and reproach (though only in Schubert’s own self-critical mind), was no longer a glowering presence. Apart from his health, everything was in place to permit the 31-year-old composer, as W H Auden put it, to fold his map of desolation and walk into his satisfaction. The mentors of his past were either melting away, their nurturing task already accomplished, or losing their former threatening aspects: Salieri had died in 1825, Spaun, Schubert’s oldest and truest friend, was about to be married, the poet Mayrhofer had retreated into the distance, the singer Vogl was now a devoted colleague rather than a patronising divo. It is true that Schubert still seemed to need the guiding hand of a father figure of sorts, something that was no doubt part of his deepest psychical need. Bearing this in mind, it should be no surprise that he later asked the counterpoint teacher Simon Sechter (only nine years older) to take him in hand, although his proposed course of study was part of a healthy enough search for enhanced musical freedom. If it had not been for his long-term illness, there is every reason to suppose that this new phase of musical confidence would have soon led to a matching personal confidence – perhaps even a settled relationship of some kind. In the meantime Schubert seems to have pinned his emotional idealism on the completely unattainable figure of Karoline Esterhazy, his pupil in Zseliz as a girl in 1818, and as an accomplished young woman in 1824. Between 1824 and 1828 there was some talk of another infatuation (with one Auguste Grünwedel if Schober is to be believed) but most of the circle seem to have realised that Karoline was Schubert’s cherished Muse; she is certainly depicted as such by Moritz von Schwind as her portrait gazes down on his famous sketch Ein Schubert-Abend bei Josef von Spaun (‘A Schubert evening at Josef von Spaun’s’). Schubert is said to have remarked that all his works were dedicated to Karoline – although the only one officially to have been thus designated was the great Fantasie in F minor for piano duet mentioned above. As John Reed points out, April was usually a good song-composing month for Schubert, and 1828 was no exception. Some of the Rellstab songs were drafted in this month including Herbst which was copied into the autograph album of Heinrich Panofka on the 28th. The fragment Lebensmut and the songs Liebesbotschaft and Frühlingssehnsucht probably date from the same time. The story is that these poems by the music critic Ludwig Rellstab had been intended for Beethoven to compose, and that they were passed on to Schubert by Beethoven’s factotum Anton Schindler. The lavish attention that Schubert paid at this stage of his life to Rellstab’s competent, but hardly first-class, poetry might be explained by this ‘Beethoven factor’. As we shall see, the Rellstab setting Auf dem Strom contains a quotation from the Marcia funebre of Beethoven’s ‘Eroica’ Symphony, as does the slow movement of the great E flat piano Trio – a work that Christopher Gibbs has called a Tombeau de Beethoven. It is as if Schubert is claiming a close blood-tie with Beethoven within the family of great composers, and that in taking over that composer’s texts (and beautifying them beyond their literary station) he is asserting his rights as Beethoven’s successor. Thus two sides of the composer are mirrored by the Schwanengesang poets: the first ‘official’ or ‘ceremonial’ where the Rellstab songs represent an act of homage to Beethoven’s memory at the same time as a claim of succession; the Heine songs, on the other hand, are a more private statement – the fruit of Schubert’s continuing and ineluctable progress as an unequalled explorer and innovator in the composition of lieder. The two sets of songs are different in mood, character, and musical texture; but both are masterly in their own ways, entirely typical of the composer’s genius. This two-sided view of his responsibilities, ‘public’ and ‘private’, is also mirrored in the great contrast in this period between such pieces as the great Mass in E flat, D950, begun in June 1828 (Beethovenian in its aspiration to musical sublimity, and written for the Church – the Holy Trinity at Alsergrund – where that composer’s funeral had taken place) and the three exquisite and understated Klavierstücke D946 which date from May 1828. It is worth noting that both forms, liturgical music and solo piano music, are typical of Beethoven’s output. There seem to be two conflicting strains in the Schubert biography at this point: on one level he seems creatively energised by a newly confident post-Beethovenian view of his powers and future, on the other, his health continued to be a problem – and what future could a syphilitic in 1828 realistically hope for in the long term? There were recurrences of the headaches, giddiness and gastritis that had marred his Graz holiday in September 1827, and his finances were not in good order despite the fact that he seems to have been earning more than usual. Perhaps there were a number of unforeseen medical expenses connected with his ongoing symptoms, and we have already seen that in treating friends to expensive concert tickets the composer could be quixotically generous with those near and dear to him. In any event Schubert was to be denied a last summer holiday, and money was the cause. An enquiry to his old friend Traweger in Gmunden concerning the possibility of a summer in Upper Austria (it would have been his first visit to that part of the world since 1825) came to nothing. It seems that the trip would have been too expensive, and one remembers that the singer Vogl had generously subsidised Schubert’s previous journeys there. Johann Baptist Jenger had long spoken of another stay in Graz where Marie Pachler was particularly looking forward to seeing Schubert again; but a letter from the composer on September 28 finally quashes all hopes of such a holiday, mentioning lack of money and the inclement autumn weather. Instead of a long time away from Vienna, Schubert made do with shorter excursions, some of which involved physical exercise on a level which has not been typical, hitherto, of his modus vivendi. Such trips were almost certainly planned in response to medical advice from his new doctor, Ernst Rinna von Sarenbach (1793-1837) who strongly advocated fresh air and exercise as part of his regime for recovery from venereal disease. In the company of Johann Schickh and Franz Lachner, Schubert made an excursion to Heiligenkreuz monastery outside Vienna on 4 June. The journey was undertaken on foot and involved a night away. Lachner and Schubert, in a spirit of friendly competition, prepared two fugues for organ which were duly played on the organ of the Cistercian abbey. This is the composer’s only solo work for this instrument. A word about Franz Lachner (1803-1890), a name that has slipped into the documents only in this last period of Schubert’s life. Of all the people in the composer’s circle he is the only fellow-composer (apart from Schubert’s old schoolfriend Anselm Hüttenbrenner). He first came to Vienna in about 1823 and was a pupil of Simon Sechter (it was very possibly his recommendation of that pedagogue that made Schubert later decide to study with Sechter). Lachner seems to have been on very intimate terms with Schubert, a friendship that involved showing each other newly completed works, spending time together at the coffee houses, and going on long walks together (including the excursion to Heiligenkreuz mentioned above). He was already deputy Kapellmeister at the Kärntnerthortheater in 1827, succeeding to the top post there in 1829. He left Vienna in 1834, ending up as Generalmusikdirektor in Munich. The composer of some two hundred songs and several operas, Lachner was a close friend of Moritz von Schwind who designed a long illustrative frieze, the so-called Lachner-Rolle, depicting various aspects of that composer’s life. Not surprisingly, Schubert features in some of these drawings. At the end of June the diary entry of Franz von Hartmann mentions a trip to Grinzing – ‘All four [of us] tipsy, more or less, but Schubert especially. Home at midnight’. This is the only contemporary description of the composer being inebriated. Much of the month of July was probably spent with the Schobers in Währing – the composer had spent part of the summer of 1826 at the same place where he composed the famous Shakespeare setting An Silvia. (This suburb of Vienna is now part of the 18th district. Schubert had also visited it in March 1827 for Beethoven’s funeral; little could he know that it was soon to be his own resting place.) We have little way of knowing what work, if any, was achieved in this period. But the manuscript of the thirteen-song Schwanengesang is dated August 1828 and it is a fair copy. It seems reasonable to suppose that the month of July was a busy one. It is also known that Psalm 92, the choral setting in Hebrew which was written for the cantor Salomon Sulzer, was composed in this month. There were other liturgical works written in this period – the Hymnus an den heiligen Geist D948, as well as a revised version of the Benedictus from the C major Mass. This suggests that Schubert was looking to church music as a future source of income, and even that he had it in mind later to apply for a Kapellmeister post, probably spurred on by Lachner’s example. The opus number of the Trio is 100. I request that the edition should be faultless and look forward to it longingly. This work is to be dedicated to nobody, save those who find pleasure in it. That is the most profitable dedication. The opening address is as near to open sarcasm as we find in the Schubert letters. It seems that the composer was annoyed by young Seidl’s typically Viennese pushiness concerning his opera libretto Der kurze Mantel. (Was there some reason, other than musical, that the song Der Wanderer an den Mond to a text of Seidl was removed from the first draft of the Schubert concert in March?) In any case, the genesis of these comic songs is more likely to have dated from a period when composer and poet were closer: 1826 is the great year of the Seidl settings, and this and 1827 were the years when the composer was in contact with the publisher Weigl. This reasoning has to be balanced with contradictory evidence – the fairly recent discovery of a sketch for Die Unterscheidung on the same piece of manuscript paper on which Schubert sketched the last movement of his Piano Sonata in C minor, D958. There was an enthusiastic review in the Theaterzeitung within a fortnight of the appearance of these songs which referred to Schubert as ‘our genius’. One can only guess that this type of publicity for these ‘light species of vaudeville’ (as the advertisement has it) was exactly opposite to the kind of attention that Schubert now craved as the serious and lofty successor to Beethoven. It was at this period that the young Robert Schumann in Leipzig was lost in admiration for Schubert’s works, particularly those for piano duet. He notes in his diary that he had written a letter to Schubert but never posted it. The idea of such a correspondence is another item in a long list of Schubertian might-have-beens. And now, almost without realising it, we have come to the final episode in our story. On 1 September Schubert, on the advice of Dr Rinna, abandoned his comfortable rooms in Schober’s apartment in the inner city and moved to the house of his brother Ferdinand (known as ‘Zur Stadt Ronsperg’) in the Wieden suburb. This was to be his last address. Today this is in a rather down-at-heel quarter of Vienna itself, not far from the Naschmarkt, a brisk walk of fifteen minutes from the Sezession building; but it was considered almost to be in the country in 1828. Ferdinand had newly moved into the recently built house and received specially reduced rental rates because the house was still damp. It was also small and less spacious than anything that the Schober home had to offer, and the sanitary arrangements were unsatisfactory to boot. Schubert never intended the move to be a permanent one – he left all his manuscripts behind at Schober’s, but he must have been worried enough about the state of his health (Deutsch mentions ‘effusions of blood and fits of giddiness’) to obey the doctor’s instructions. The paradox of such a move is that the insalubrious conditions in the Wieden no doubt hastened the composer’s end. The composer’s retreat to quarters outside the city wall was the first stage in his abdication from life itself, although it certainly did not seem so at the time. Although friends like Jenger could not find him at his old address (it was perhaps part of the doctor’s idea to place Schubert far away from the temptation of parties and alcohol) it was simple enough for the composer to make the trip back into town. Indeed the walk would have been thought to do him good. In the first week of September he encountered Jenger at the Burgtheater and assured him that he still intended to spend the month of October in Graz with the Pachlers. That Schubert still journeyed to see his friends at the old haunts (like Bogner’s café) is once again indicated by a letter to Jenger of 25 September. In this we learn that Schubert had recently handed over the second half of Winterreise to Haslinger to prepare for publication. The work had long been ready for engraving (and indeed promised to the public by Haslinger’s advertisement as long ago as January) but there were no doubt reasons why the publisher was able to proceed only in September; Schubert worked on the proofs in the middle of November on his deathbed. In the same letter Schubert agreed to go with Jenger to a party (at the home of a Dr Menz) where Baron Schönstein was to be singing. It is said that on this occasion, September 27, he played all three of his newly completed piano sonatas (C minor D958, A major D959 and B flat major D960) – an exhausting task in itself, even for a totally healthy man. On 2 October Schubert sat down and wrote desperate letters to both the German publishers, Schott and Probst, who had been flirting (not to say trifling) with him since February. He was hoping in vain that the piano Impromptus Op 142 would appear with Schott, and we find him still concerned about Probst’s delay in issuing the E flat Trio. At this point he strikes a pathetic, rather than an angry or scornful, note: ‘I beg to inquire when the Trio is to appear at last. Can it be that you do not know the opus number yet? It is Op 100. I await its appearance with longing’. He already seems a broken man, and these letters rend the heart of the reader. It is a measure of the composer’s need for money that he goes on to offer Probst his latest and best works (despite the fact that the publisher has roundly proved himself slippery and rather dishonest): the three new piano sonatas, the string quintet and ‘several songs by Heine of Hamburg which pleased extraordinarily here’. Whether this last phrase indicates that Schubert truly considered the Heine songs a separate entity, or whether his offer of them on their own, and separated from the Rellstab songs was, in Deutsch’s words, ‘an act of sacrifice, due no doubt to financial difficulties’, remains a moot point. In any case, never was a publisher offered such a treasure-trove. Needless to say Probst only expressed a mild interest in the songs. He was never to receive them. On 6 October the Kuffner setting Glaube, Hoffnung und Liebe was advertised by Diabelli as Op 97. Like Schwanengesang, the autograph is dated August 1828. Its choice of subject matter may have everything to do with the choral piece of the same name (and to an entirely different text by Reil) which had been commissioned by the Church of the Holy Trinity at Alsergrund where the composer’s boyhood friend, Michael Leitermayer, was official organist. This choral piece was first performed on 2 September. The song is cast as a homily, and as such is not a typical lied – more like the Masonic cantata of Mozart in Zauberflöte mould and to Ziegenhagen’s words beginning ‘Die ihr des unermesslichen Weltalls Schöpfer ehrt’. On 6 October Schubert set off on another excursion that seems to be rather too strenuous to have been undertaken for pleasure alone; the influence of Dr Rinna can be detected in the plan to travel a round trip of fifty miles on foot to visit Josef Haydn’s grave at the castle of Eisenstadt. (Schubert had already visited Michael Haydn’s grave in Salzburg in September 1825.) The composer’s brother Ferdinand took part in the expedition, as did two other friends. The journey involved a full three days of vigorous walking, and there is no record whatever of Schubert’s pleasure, or otherwise, in the experience. As much as he revered Haydn, he was no doubt exhausted by the journey. He was overweight in any case; and he had long suffered from the vitiating effects of syphilis and its treatment. Apart from the headaches, giddiness and high blood-pressure already mentioned, these probably included anaemia: towards the end the composer often complained of extreme tiredness – ‘I am so exhausted I feel as if I were going to fall through the bed’ is a remark from the last days. Feeling like this, the idea of a 28-hour stagecoach journey to the Hungarian city of Pest to see a performance of Franz Lachner’s new opera could not have seemed an inviting prospect. This was the invitation of Anton Schindler in a letter of 11 October; at the same time Schindler proposed a public concert devoted entirely to Schubert’s lieder (it would have been the first) in Pest. The pushy, even bossy, tone of the letter implies that Schindler, having lost his former master, Beethoven, was on the point of taking up Schubert’s career as a ‘cause’; it is one of various loose threads at the end of Schubert’s life that may have led somewhere interesting. Schindler was, after all, a first-class public relations man, one of the first ever musical spin doctors. It is amazing with his Hungarian connection that he did not attach himself to the up-and-coming young piano virtuoso who might then have become known as ‘Schindler’s Liszt’. Like all true artists, Schubert could not really take such people seriously; Schindler’s letter attempting to jolly along the composer into travelling to Hungary received no reply. At this stage Schubert still seems to have been up and about, even if it was by a mighty effort. He wrote his last songs in October – a cantata for voice, clarinet and piano on texts of Müller and von Chézy entitled Der Hirt auf dem Felsen, and Die Taubenpost which showed that Seidl’s poetry was back in favour, no doubt because these words stirred a quintessentially Schubertian response. The composer returned to the parental home on the Himmelpfortgrund on 31 October. Legend has it that he ate a bad fish on that evening at the ‘Red Cross’ tavern. The debilitating effects, if the fish was to blame for illness, were immediate but initially not too disturbing – he was able to go on a three-hour walk with his brother on 3 November, but continued to feel nauseous. From what he later wrote to Schober, we learn that the composer was completely unable to eat anything in the eleven days after ingesting that bad fish. Nevertheless, on November 4 he went, together with Josef Lanz, to the home of Simon Sechter for a lesson in counterpoint. The manuscript evidence of this encounter has survived: it seems that Schubert was concerned to learn the secret of varying the real answer in the successive statements of the fugal subject so that his counterpoint would not sound lifelessly academic. Sechter suggested a fugal exercise based on the musical letters of Schubert’s own name, but the second lesson scheduled for 10 November, when Schubert would have returned with the fruits of his homework, never took place. There is also some evidence that Schubert’s sketches for new symphony in D major (with an andante movement in B minor) date from this time, much later than was thought before detailed paper studies revealed at least some of the secrets of what Reed calls ‘these inchoate sketches’. Schubert took to his bed on 11 or 12 November and remained there. He was cared for by Ferdinand, his wife Anna, and possibly by his twelve-year-old niece, Therese. Spaun also tells us that the composer’s half-sister Josefa was also a devoted nurse (those who saw the scenes between Schubert and Josefa in Fritz Lehner’s biographical film about Schubert will not soon forget them). The composer lay in the narrow room in the small second-floor apartment with a single window looking out on to the building opposite and the street. His last letter to Franz von Schober is famous, but it should be quoted as one of the composer’s most honest and direct communications, written without undue self-pity, but with an elegiac quality that is subtle, understated and deeply moving. I am ill. I have eaten nothing for eleven days and drunk nothing, and I totter feebly and shakily from my chair to bed and back again. Rinna is treating me. If ever I take anything, I bring it up again at once. Be so kind then, as to assist me in this desperate situation by means of literature. Of Cooper’s I have read The Last of the Mohicans, The Spy, The Pilot and The Pioneers. If by any chance you have anything else of his, I implore you to deposit it with Frau Bogner at the coffee-house for me. My brother, who is conscientiousness itself, will most faithfully pass it on to me. Or anything else. That letter tells us much – we learn unexpectedly, for example, how quick a reader Schubert was, and how he devoured literature – that should come as no surprise to his lieder public: the composer actually read all the volumes of poetry that came into his possession, indeed he must have been among the very best-read of people in Vienna. But the personal information it contains is even more interesting. Other friends came to visit – like Lachner and Bauernfeld (the latter had written the libretto of Schubert’s last, uncompleted opera Der Graf von Gleichen, a project which was discussed as if the composer fully expected to continue work on it as soon as he recovered). But Schober, who was probably afraid of infection, stayed away. This letter shows us how very much Schubert minded. That final ‘Or anything else’ is heartbreaking; it is as if he was waiting for any sign of Schober’s concern or affection, but was too proud to ask for it. (It is not impossible that the move to the Wieden was partially linked with some temporary rift between them, or even the composer’s temporary inability to continue paying Schober rent in the Tuchlauben.) The lack of a visit from Schober (although he may well have sent the requested copies of Fennimore Cooper novels) has made posterity judge him poorly – he undoubtedly failed Schubert in his hour of need. The obsession with Beethoven continues right until the end. In his last days Schubert expressed a desire to hear Beethoven’s C sharp minor Quartet Op 131; this was arranged thanks to the violinist Karl Holz and his colleagues. Holz later recounted his memories: ‘Schubert was sent into such transports of delight and enthusiasm and was so overcome that we all feared for him … the quartet was to be the last music he heard. The king of harmony had sent the king of song a friendly bidding to the crossing’. Dr Rinna was ill and he was replaced by Josef von Vering who was also a specialist in venereal disease; he was later assisted by yet another doctor – Johann Wisgrill. This phalanx of visiting specialists indicates that Schubert’s illness was far from a ‘simple’ case of food poisoning or even typhus. Vering later admitted that he had regarded Schubert’s case as hopeless because of ‘the advanced decomposition of the blood’. The medical bills paid after Schubert’s death are also revealing; it is clear from these that the visitors to Ferdinand’s house were spared the full picture – the composer had terrible skin lesions (probably not affecting the face, so invisible to his friends) which required constant attention. These were not referred to afterwards – the family was discreet and ashamed of the syphilitic aspect of the illness – but the complicated task of dressing open wounds explains why the composer needed constant nursing by more than one relative and, towards the end, the help of a professional male nurse. So it becomes clear that Schubert’s death was caused by a combination of causes: he had a constitution severely undermined by struggling with venereal infection for nearly six years. Although he was probably not yet in the tertiary state of the disease, he was vulnerable to opportunistic infections of every kind. On top of this a bacterial illness carried by food or water, dangerous enough in ordinary circumstances, would have been exacerbated by the composer’s inability to fight off infection. He was ‘compos mentis’ almost to the end, which shows that, had he not been so constitutionally weak, he may well have survived a bacillus which might not have been inevitably fatal in itself. (It is said that he was delirious right at the end, singing ceaselessly, but he was still strong enough to correct the proofs of the second part of Winterreise, his last musical task.) What finally actually killed him may have been an aneurism, a result of a weakening of the heart or brain vessels caused by secondary syphilis. But this is only one theory. It is possible that the short-term illness which speeded his life to its tragic close at that moment in November 1828 was not in itself syphilitic. That Schubert was spared tertiary syphilis, and all the horror of the mental deterioration which went with it, was a real blessing – a merciful commuting of the full sentence. What could have been worse for him than to lose his ability to compose? It is glorious that his story does not include the sad artistic deterioration of a Schumann, a Wolf or a Baudelaire. But then his life, like his death, and like his music itself, was never governed by black and white, but rather by a multiplicity of merging and melting colours and sounds. (It is said that he sang increasingly in his last days; one would dearly love to know what – perhaps melodies from Winterreise and Schwanengesang, or perhaps tunes and phrases as yet unborn and never committed to paper.) In a way the fates were kinder than they might have been: it could be that he was like a cancer sufferer spared hours, days, even months of terrible pain by the kindly intervention of a heart attack. Although it is fairly clear that Schubert had not expected to die so quickly, there is no doubt that he felt somehow marked out for death from the onset of his disease in 1822/23. But despite his awareness of living beneath the Damoclesian sword he was probably aware that he was dying only in the last few days of his life. When the realisation came, ‘Schubert looked fixedly into the doctor’s eyes’ (Ferdinand Schubert later wrote), ‘grasped at the wall with a feeble hand, and said slowly and seriously, “Here, here is my end!”’. According to the custom of the time he was buried with a cross in his hand, dressed in the linen garb of a penitent. Whatever Schubert’s feelings about the Roman Catholic Church, his father’s strict adherence to the faith would have ensured a conventional Catholic burial. The image of someone forced to submit to the last rites on the threshold of death is one of the most potent (though unsubstantiated) images of the Fritz Lehner film about the composer. Schubert was fortunate to have a devoted brother in Ferdinand, who went to some trouble to fulfil the composer’s whispered dying wishes. Normally the body, after a blessing at a local church, would have been taken to the official burial ground for the Wieden district; but Schubert had said in his last hours that he wished to lie next to Beethoven. This was the last and most profound of his pleas that his contemporaries, and thus all of us who have come after him, should identify him with his immortal forebear. It was a desire stemming from the very heart of Schubert’s own belief in his place in musical history, and it was honoured by his friends and family, some of whom, even then, sensed the justice of his beliefs. Schubert’s body was taken some distance to the Währinger cemetery where Beethoven had been buried the year before. It was not possible for him to lie right next to the older composer, but he was placed two grave-plots away from his idol. (Schumann later went to visit the graves and wrote to Clara that he rather envied the man who lay between them – a certain Colonel O’Donnell.) A permanent memorial, designed by Schober, and with a bust by Josef Dialer and an inscription by Franz Grillparzer (quoted at the top of this essay) was erected in 1830. Care seems to have been taken that this Greek temple-like construction should not stand as high as the Beethoven column to the left of it. Fifty-eight years later Schubert’s body (and Beethoven’s) were exhumed and taken to the grand, and rather inappropriately pompous, new monuments in the Zentralfriedhof. (The one appropriate thing about this new locale is that the tombs of Schubert and Wolf are situated back-to-back as if representing different sides of the art of lieder.) The Währinger cemetery ceased to be consecrated ground and was turned into a park, although the two memorials were allowed to stand. Today Turkish children play in the ‘Schubert Park’ without having any idea why oddly emotional admirers (myself and the photographer Malcolm Crowthers among them – see the cover of this disc) should pay attention to these rather uncared-for memorials situated between a wall and a pathway overrun by youngsters’ bicycles. The pair of graves between those of the two composers are no longer identified. Beethoven and Schubert now lie, if not exactly together, then inextricably linked, each within the space of his own immortality. In this unlikely space in an unfashionable corner of Vienna, and despite an ugly backdrop of council flats erected in the 1920s, we recapture the scale of Biedermeier culture with greater accuracy than in the stately memorials built in the era of Franz Josef. It is a surprisingly difficult thing to place the songs of this year in an order which reflects exactly when they were composed. In 1815 Schubert would write as many as seven songs in a day, dating all the manuscripts; but the working practice of later years shows a much longer gestation process for fewer, and more important, works. It is almost always possible to ascertain when a piece of music was published, but a song’s initial sketches, if they exist at all, usually date from a long time before that. If these sketches are undated, or if they have disappeared, we are left in the dark concerning the timetable of the work’s genesis. A fair copy of a work prepared for the publisher is not always helpful: this can be dated a long time after the work in question was actually composed. We actually know which songs were the last – Der Hirt auf dem Felsen and Die Taubenpost – but other chronologies of 1828, particularly relating to Schwanengesang, are less certain. A number of the lieder from 1828 have already appeared in this series, but as this disc is a portrait of the year we have proposed an order that is as chronologically accurate as possible, and is also consistent with various phases of the year when Schubert was attracted to different poets. The disc ends with Johann Gabriel Seidl, but it might also have begun with him. It is clear that Die Taubenpost, issued as the fourteenth song of the posthumously published cycle Schwanengesang, is the last of Schubert’s songs. At the other end of the disc there are certain reasons for thinking that at least some of the Seidl Vier Refrainlieder, including Bei dir allein and Irdisches Glück, were already extant by at least the beginning of 1828. The set was published in mid-August, but the publisher and the choice of poetry (and thus the musical tone) point to an earlier date of composition, perhaps some time in 1826 or 1827. If this is so, the delay in their appearance was probably something to do with the firm of Thaddäus Weigl who, like any publisher, planned appearances of music to meet market considerations; publication in August was no doubt aimed to catch the new party season beginning in the autumn. The one crucial piece of evidence to the contrary is the fact that a sketch for the first of the Refrainlieder (Die Unterscheidung) is to be found on the second sheet of a manuscript that also includes a sketch for the fourth movement of the C minor Piano Sonata D958 completed in September 1828. If this song (and perhaps the others) date from the summer of 1828, the publisher would have had to engineer an untypical lightning turnaround in order for the pieces to be published by August. Again, for the commercial reasons mentioned above, this might have been possible. On this programme the two Seidl settings from the Refrainlieder appear between the earlier Rellstab song Herbst and the later Rellstab songs firmly associated with Schwanengesang. In comparison, Auf dem Strom is one of the more simple pieces of detective work. It was written especially for the Schubert concert of 26 March to allow the collaboration of the tenor Ludwig Titze and the distinguished horn-player Josef Lewy. As a pièce d’occasion, wonderfully polished music though it is, we can assume that the interval between the work’s composition and its first performance was fairly short, even allowing for a decent amount of time for the performers to master its difficulties. Auf dem Strom and the two Seidl Refrainlieder are sung here by Michael Schade, with an intervention by John Mark Ainsley for Herbst. Anthony Rolfe Johnson appears later with the Heine settings – this is Hyperion’s lieder-singing version of ‘the three tenors’: they even share a song (Glaube, Hoffnung und Liebe). Towards the end of April 1828, Herbst with a text of Ludwig Rellstab, was copied into the album of the composer and critic Heinrich Panofka. As no other copy of the song exists we must assume that this was one of a number of Rellstab songs dating from this month, and perhaps earlier – so as to be contemporary with Auf dem Strom. The exact order is impossible to ascertain, but it seems very likely that the sketch of the fragment Lebensmut dates from the same time as Herbst, as well as Liebesbotschaft and Frühlingssehnsucht, the only other songs from the seven-song Relltstab cycle for which sketches exist. It is thought that Schubert initially intended that Lebensmut should open the Rellstab ‘cycle’, but he then abandoned the idea. Because this song comes directly before Liebebotschaft in this disc the listener, despite a change of singer, can hear the set, if he wishes, in what might have been its original sequence. The energetic B flat major of Lebensmut, and the watery mellifluous character of Liebebotschaft in G major, bear an uncanny resemblance to another famous opening pair of songs in the same keys: Das Wandern and Wohin? from Die schöne Müllerin. The Rellstab sequence in the order in which it was published is to be heard on tracks 6 to 12 of this disc. There is a fair copy of thirteen Schwanengesang songs (seven by Rellstab and six by Heine) in Schubert’s hand dated August 1828, and the order here is the one which is familiar to us through the Peters Edition as well as the old Gesamtausgabe, and the Neue Schubert Ausgabe. A huge amount of effort has been spent by scholars of every hue on ‘deconstructing’ this cycle, splitting it into two parts and re-ordering all the songs according to any number of varied arguments, both musical and literary. The Heine ‘cycle’ in particular has been subject to any amount of suggested re-ordering to bring it into line with what are claimed to be the poet’s narrative intentions, or with subtle key-relationships and progressions, some of which suggest sequences found nowhere else in Schubert’s works. Here one must acknowledge the often passionately argued theories of such scholars as Maurice Brown, Harry Goldschmidt, Richard Kramer and so on. The temptation (someone referred to it as the modern habit of ‘reinventing the discipline of musicology’) is to find the most complicated answers to simple questions. Now such commentators as Douglass Seatton, Louise Litterick and Martin Chusid (in a recent study entirely devoted to Schwanengesang) have restored a certain down-to-earth commonsense in their reaction to this work. The fact that the composer himself prepared a manuscript where the Heine songs follow directly on from the Rellstab surely reinforces Spaun’s contention that the composer had intended the thirteen songs as a garland (not titled Schwanengesang at that stage of course!) to be dedicated to his friends. Perhaps Schubert discussed this idea with Haslinger when the composer handed over the fair copy of the second part of Winterreise in the last months of his life? The manuscript was in Ferdinand’s possession and was passed on to Haslinger to be published by May 1829. The lack of a narrative thread in either set has worried many scholars who proceed to argue for one, even if it means forcing a storyline on something (by re-ordering the songs) which is surely meant to make more of a kaleidoscopic impression. But there is a strong argument that Schubert was not interested in writing the same sort of integrated work as the other two cycles. He had received a stinging criticism from a Munich critic concerning his tendency to write in long groups of inter-related songs; here for the first time he offers a group of song not related by a narrative. Rather are the songs of Schwanengesang connected by what any practising recitalist would recognise simply as good programme-planning – telling contrasts of tempo, mood, metre and key. (In this respect Schubert seems to be anticipating the Schumann of the Eichendorff Liederkreis and Dichterliebe rather than Frauenliebe und -leben). The planning of appropriate key relationships involves a world of possibilities analogous to a writer’s skill in punctuation and paragraphing: using tonal juxtapositions, songs can be ‘moved’ closer together or farther apart according to their mood and according to whether one is making a segue from one aspect of a subject to another, or changing the subject altogether. Any artist who has made a song CD knows how potently such groupings can affect the listener’s impression; the planning of such compilations is simply another branch of the anthologist’s art. On this disc there are ten Rellstab settings. The first is Auf dem Strom sung by Michael Schade, who also performs Lebensmut. The remaining eight (including Herbst) and the famous sequence of songs from Schwanengesang are sung by John Mark Ainsley. And then? Well, a compromise when it comes to the Heine cycle, a nod to the many people who see two entirely different cycles under the umbrella of a single publication. It had long been my decision to have the two constituent parts of Schwanengesang performed by two singers of different timbre – one of a lighter, one of a darker hue. But I also wanted two tenors with voices generically similar (though different in colour) so there was no outright dislocation of tessitura or original-key tonality in the progression that might have been planned by Schubert himself. This is a deliberate attempt to achieve a type of unity in diversity, a means of ‘paragraphing’, without actually separating or splintering, the constituent parts of this controversial work. There is a theory that the Heine songs precede the Rellstab in terms of chronology (they were perhaps sketched at the beginning of the year), but the fair copy of August 1828 places them firmly in the order with which we are familiar. I have made one further small concession to the theory of two separate cycles in which some scholars still believe. I have taken the liberty of inserting a single song, shared by all three of this disc’s singers as a type of trio, to act as the pivotal point between the Rellstab and Heine groups. This is the curious Masonic-like song Glaube, Hoffnung und Liebe which is otherwise hard to place, and the manuscript of which is also dated August 1828. (In the opening of this piece Anthony Rolfe Johnson sings the word ‘Glaube’, John Mark Ainsley ‘Hoffnung’ and Michael Schade ‘Liebe’; the singers then share the song’s various verses between them.) It is not possible to have an ‘interval’ on a CD (as it was on a two-sided LP). The preceding song, the Rellstab Abschied, is in a fast E flat major; Glaube, Hoffnung und Liebe is also in this key (though in a very different tempo) so that the change to the G minor of Der Atlas (the first of the Heine songs) is preserved. Those who wish to hear the ‘conventionally’ ordered Schwanengesang without this interpolation will easily be able to programme their players to skip track 13. We end the recital, and the whole of this enormous series, with Die Taubenpost, Schubert’s last song. After all, what other song could bring this project to an end? It was no doubt Haslinger’s decision to append a fourteenth song to the thirteen in Schubert’s manuscript, but it was far from a bad idea; indeed, it might be taken to be an inspired piece of programme-planning from someone who knew what works in musical terms, whatever the objections based on a horror of literary untidiness. Countless audiences have felt themselves healed of the horrors of Der Doppelgänger by this music. And why? Die Taubenpost is the most potent envoi and the most Schubertian of envoys – it makes us smile and at the same time it breaks the heart. That carrier pigeon flying without expectation of reward, simply because it was made that way, is as wonderful an analogy for the composer himself in his brave and brief progress through the world as can possibly be imagined. It restores a human scale to this strangely hybrid cycle which no other song could achieve in quite the same way.